A quirky British comedy like no other, Chickens follows the antics of three young men who are left at home while other British men are fighting the Great War. 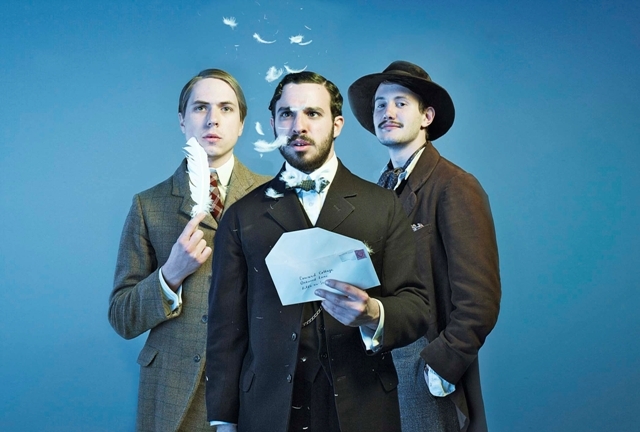 Written by and starring Simon Bird, Joe Thomas (The Inbetweeners) & Jonny Sweet, Chickens tells the story of three young men who are at home in a sleepy English village while other British men are on foreign soil fighting the Great War. Meet George, Cecil and Bert. George is a conscientious objector. The army won’t have Cecil because of his flat feet. Bert is a philandering scardicat, who’s on the run from the draft and insists on hanging around with them. As far as the other villagers are concerned, they’re all the same : Chickens. As the only twenty-something males in a world of women, children and the infirm, they have only each other for company. Unsurprisingly they’re treated with contempt by the women in the village, but with every other man away they’re working hard to win over the ladies on the home front. Chickens is a sitcom about three young guys in a women’s world, not being useful, not being proper men, not contributing to their country – but trying to make the best of it, trying to be helpful, trying to enjoy themselves…and above all, trying not to be rubbish. Some of the filming took place in Chilham which is a village in the Ashford borough of Kent and has a stunning fifteenth century square of black and white timbered buildings. Chilham has been the backdrop for many filming projects including Top Gear (2011), Emma (2009) and Miss Marple – The Moving Finger (2005). Chickens was shown on Friday 2nd September 2011 on Channel 4 at 10.30pm. This entry was posted in Filmed in Kent and tagged Chickens film locations, Chilham, Joe Thomas, Jonny Sweet, Simon Bird, tv entertainment. Bookmark the permalink.